Will the Bucks cruise past the Pistons? How will Boston fare without Marcus Smart? Will Kawhi morph into Playoff Kawhi? The Crossover previews the Eastern Conference's first-round matchups. Mmmm. That seductive aroma currently filling your living space is none other than the NBA playoffs, which are ready to be taken out of the oven and enjoyed by the masses. That’s right, it’s postseason time, and for the first time since 2010, the Eastern Conference will not feature LeBron James’s team in the Finals. That’s because a) LeBron plays in the West and b) LeBron is not in the playoffs. Don‘t fret—there’s still plenty of firepower in the East, and new stars are ready to emerge. Let’s preview the first round. Most Intriguing Storyline: What is the status of Blake Griffin’s left knee? The only hint of spice in an otherwise bland series is Blake Griffin’s health. The Pistons’ star forward missed the team’s regular season finale—a must-win game—after tweaking his knee Tuesday against the Grizzlies. Griffin has been on the injury report for much of Detroit’s playoff push, and he missed some key contests. The Pistons only chance at keeping this series interesting is if Blake is healthy. It’s possible he can swing a game by himself. (I don’t want to slight Andre Drummond—he’s had an awesome season as well.) But the Bucks are going to be overwhelming favorites even with a healthy Griffin. If Blake misses any time, this series is over in four. On the Milwaukee side…the Bucks should be able to cruise through the first round. Playing against a team that likes to play big should actually benefit Brook Lopez, who is an integral part of the team’s attack. Milwaukee still has some things to prove later in the postseason, but this series presents minimal challenges for Giannis and co.
With Malcolm Brogdon likely to miss the first round, more pressure will shift onto Eric Bledsoe in the backcourt. Bledsoe is seeking a bit of redemption after his tortured first round against the Celtics last year, when his play faltered while he publicly lost the trash talk battle to Terry Rozier. The Pistons series is an opportunity for Bledsoe to build back some confidence for the rest of the run. Reggie Jackson should provide an adequate challenge, and Bledsoe needs to use these early games to shake off any questions about himself as a playoff performer. The Bucks don’t have a lot of postseason experience, and they aren’t as star-laden as some of their conference counterparts. Bledsoe taking his game to another level in the opening round could pay big dividends moving forward. The Pick: Bucks in four. Most Intriguing Storyline: Will Kawhi Morph Into Playoff Kawhi? The last time we saw Kawhi Leonard in the playoffs, he was making an argument for himself to be included in the top three basketball players in the known universe. In 2017, Leonard was on another level, going liquid-metal Terminator against the Grizzlies and then leading the Spurs to a huge lead against the Warriors before his ankle injury. Since then, Kawhi has taken a step back, thanks to his strange injury saga in San Antonio and a load-managed season in Toronto. If Leonard flashes the game he had in 2017, that’s concerning for the East. The Raptors are already loaded with a mix of solid young pieces and veterans with tons of playoff experience. If Leonard goes to another level—one he’s already shown he’s capable of—Toronto becomes much scarier, and maybe even a threat to the Warriors. If Leonard is still pacing himself, or worse, looks uninterested, then not only will he invite speculation about his future, but also if he can ever recapture the form he had pre-injury. 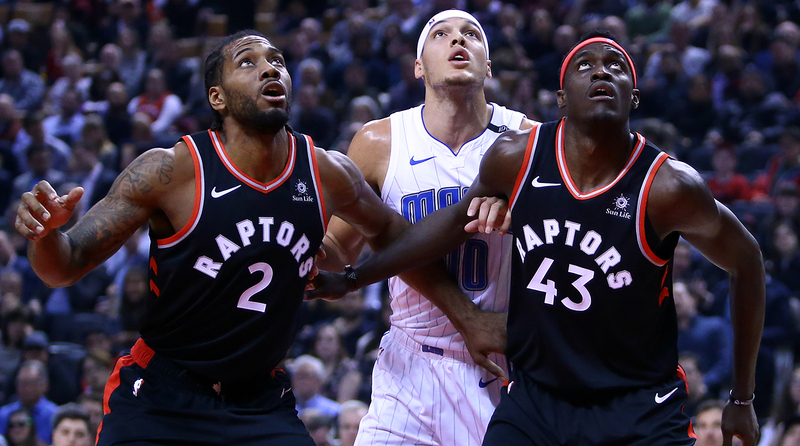 There’s so much talk about Pascal Siakam and the improvements he’s made this season, as well as Kyle Lowry and what he provides when he’s healthy, that sometimes there’s not enough space to discuss Danny Green. The sharpshooting guard is drilling an absurd 45.5% of his three-pointers this year, while playing top-flight defense on the other end. In some ways, he himself could be an upgrade from DeMar DeRozan for the Raptors during the playoffs. Green is a plus-minus god, and this team really seems to function better when he’s on the court. If everyone else does their job and Green is raining threes and locking guys down, he helps raise Toronto’s ceiling quite a bit. I don’t want to ignore the Magic completely. Terrence Ross and Nikola Vucevic have had great seasons, and Orlando actually beat Toronto twice during the regular season. Maybe Vooch can swing a game himself, or put a lot of pressure on the Raptors’ bigs. But it’s hard to see this series being very competitive if Toronto is fully healthy. The Pick: Raptors in four. Orlando is just happy to be here. It’s really unclear what the status of Joel Embiid will be entering Game 1 of the ’yoffs. The loquacious center missed 14 of Philly’s last 24 games because of knee soreness. Will he be healthy for the entire series? Will Philly be extra cautious and hold him out? Remember—Embiid missed the first couple games of last year’s postseason as well. He returned to play well against the Heat, but at times looked out of shape, especially during the Sixers’ second-round loss to the Celtics. Holding Embiid out makes sense, but not if it means he has to play himself into shape during a push to make the Finals. Elton Brand in bold was re-making his roster this season, but his moves will matter very little if Embiid—the team’s best player—isn’t healthy for the postseason. How Philly handles keeping the big man healthy while also conditioned enough to play will be critical for its championship aspirations. So let’s say Embiid does end up missing time in this series, who is the next best player on the floor? Ben Simmons is realistically the right answer, but what if D’Angelo Russell takes another step up? Russell has been incredible this season, performing a mini-James Harden impression en route to averaging 21-4-7 for the sixth-place Nets. Simmons lack of jump shot eventually hurt him against the Celtics last year, though Brooklyn can’t be expected to defend him with the same level of expertise. But if Russell has another gear to reach in the postseason, he’s exactly the kind of player who can steal a game or two. The Nets are almost definitely not winning this series, but Russell is worth keeping an eye on either way. Brooklyn will be going big-game hunting this summer, and has a decision to make on Russell’s future. An impressive showing from him would all but guarantee a max deal in July. The pick: Sixers in five. Philly has too much talent in the starting five to bow out this early, even with an iffy Embiid. 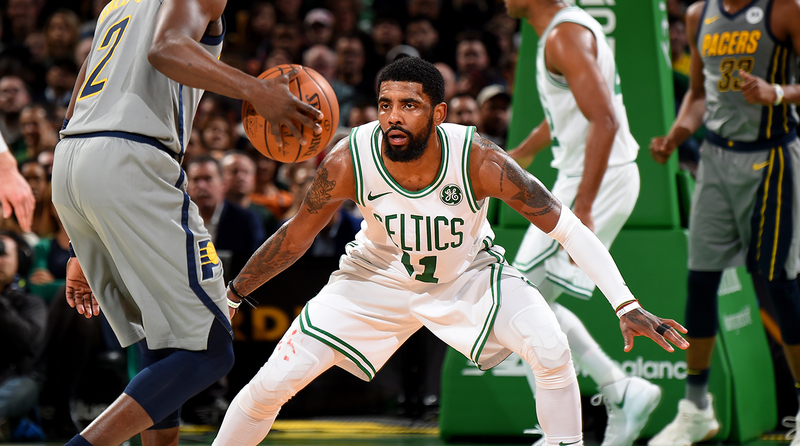 Throughout the Celtics’ up-and-down season, Brad Stevens has tinkered with the team’s rotation, hoping to find the right combinations to unlock all the talent on the roster. The Kyrie-Jaylen-Jayson-Hayward-Horford group was a bust, while inserting Marcus Smart and Marcus Morris for Jaylen and Hayward brought more success. Most recently, Stevens has turned to a Horford-Aron Baynes frontcourt, which has been stingy defensively and helped propel Boston to one of its more promising stretches of the season. But now Smart is hurt, and likely to miss the first two rounds of the playoffs—if the Celtics make it that far. How does Boston compensate for the guy who is the heart of the team? Jaylen Brown will likely start, but someone else will have to step up on the margins. Guys like Smart and Baynes are less heralded than Boston’s other contributors, but they’ve played big roles in any positive stretches. This is bad timing for Stevens to be messing around with his rotation, but at least he has plenty of experience in dealing with this problem. Hayward has looked more spry of late, and he’s finally starting to resemble more of the player who signed with the Celtics in the summer of 2017 before his gruesome leg injury. If Hayward continues to improve, then I don’t think Indiana has the firepower to keep up with Boston. The Cs already have more top-end talent, and Kyrie Irving has always taken his game up several notches in the postseason. If Hayward is also finding success, carrying bench lineups and knocking down open threes, the Pacers’ stout defense can only do so much. Shout out to Indiana for keeping its season together in the wake of Victor Oladipo’s injury. This defense is legit. But even as disappointing as Boston has been at times this season, this will be a tough upset for Indy to pull off if the Celtics’ best talent plays up to their potential. The pick: Celtics in six. Boston likes to mix in drama, but the Celtics should be in control of this series.